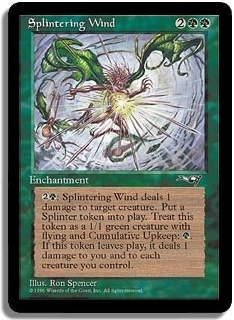 Typically any card with cumulative upkeep is rubbish and believe me, I just picked up my copy of Splintering Wind dirt cheap. The trick is to get enough Enrage dinosaurs out , ping one with Splintering Wind, and then ping the creature created each time after that, since the damage to all is actually exactly what you want. Ripjaw Raptor - reusable card draw for 3 mana at instant speed in green is ridiculous. Vigor is just the icing on the cake. 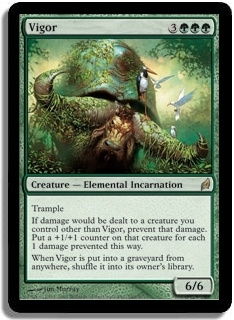 Rite of Passage, the aforementioned Aegisaur, and other things keep your creatures alive. Yes there are plenty of enrage dinos with lifegain.